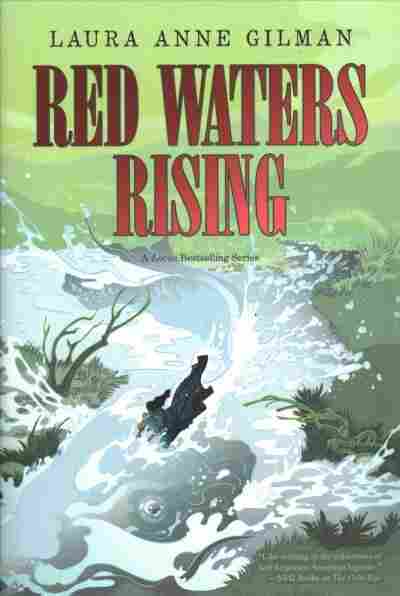 'Red Waters Rising' Leads Old Friends Into New Trouble Laura Anne Gilman winds up her Devil's West trilogy with a fascinating story of tension and friction between old friends and new enemies, marred only by some odd choices at the end. In the Devil's West trilogy, Laura Anne Gilman has given us an imagined history of the United States — one that feels nearly as true as facts, both crazier and more reasoned than our Old West reality. Silver On The Road defined that world. One where the Devil — the actual Devil, smelling warmly of whiskey and tobacco, dressed in a prim cardsharp's suit — holds dominion over everything in the United States west of the Mississippi, and defends it and its people from the predation and influence of Washington, Spain, the French and all of the East. From a town called Flood, he makes his deals and sends his chosen out into the world — one of them being Isobel, a teenaged girl, raised at the Devil's knee and then sent forth (along with her mentor, Gabriel) into the Territory as his Left Hand. She is the Devil's cold eye, final word and, when necessary, his justice. In The Cold Eye, Isobel's journey continues. She grows, matures, learns more and more. She and Gabriel make enemies and overcome them. They see power and confront it, bending ever easterly in their travels, drawing closer and closer to the banks of the Mississippi River, the boundary of the Devil's sway. And in Gilman's newest novel, Red Waters Rising, that's where they begin: Isobel, months into her mentorship ride, has become a capable companion for Gabriel. And Gabriel, ever the teacher, ever the willing piece on the Devil's chessboard, is ... unsettled. Red Waters serves two purposes in this series. Really, three. First, it was the book that had to happen. Having explored the far west and the middle west in the first two books, Isobel and Gabriel had to eventually make it to the banks of the Big Muddy in order to witness that place where Gilman's imaginary world chafes against the borders of the real. Second, it was the book that Gilman needed to show the final piece of her beautiful construction — the city. Isobel has never seen a town containing more than a hundred-odd souls. She has found her comfort on the road — in wild places, among people who prefer to rarely see their neighbors. Red Waters, therefore, had to represent an unsettling. It had to be something new. And it is. Gilman is magic in that junction point between the real and the imaginary, and she's remarkable in allowing her world to grow solely out of the observations of her main character. Isobel is not just the reader surrogate, but a rounded, living, breathing, aching, regretting, exhausted, terrified, joyous and (so, so often) terribly confused vessel through which we experience Gilman's deep and interconnected world. Gabriel is the unsteady one now. Too close to the East, where some of the worst of his memories come from, he also knows he's reaching obsolescence. For a year, Isobel has been his charge, her education (and her survival) part of the deal he made with the Devil way back in Flood. But now, she is outgrowing him. He knows it. And Isobel does, too, though she won't accept it. And this tension is what they carry with them into Red Stick — the largest city in the Territory, existing right on the edge of the river. Red Stick, too, is on edge. It is the place where the Devil's agreement with the Territory is beginning to break down — where distrust, religious fervor, fear of foreigners and Native Americans and the East and everything else has worn the people thin. Isobel comes, as the Devil's instrument, to settle things. Not to soothe, not to comfort, but to end them. Which leads me to the third purpose of Red Waters: It is a bridge. Isobel's story has just begun. She may have moved beyond the need for Gabriel, but there are a lot of stories left out there in the Territory — a universe of existential threats waiting for her attention. An un-stuck landing lingers like a bad taste sometimes, but this one comes at the end of an otherwise fascinating story. Of course, that comes with a downside, too. Red Waters, by its very nature, feels incomplete. The stakes in Red Stick were made abundantly clear. The resolution? Not so much. It felt hurried, choppy and ... lightweight in a way that nothing else in Gilman's series has. And while I understand the necessity (and the function) of the choices Gilman made, it bothers me that they were made at the expense of the story. None of which is to say Red Waters isn't worth it. An un-stuck landing lingers like a bad taste sometimes, but this one comes at the end of an otherwise fascinating story of tension and friction between old friends and new enemies, between worlds existing in direct contact and competition. It did what it promised to do — bringing Isobel's first ride to an end at the only place it could — and leaves her changed, smarter and stronger. I know for sure that Gabriel's story isn't over (he'll have his own novella out next). But Isobel? She needs a long rest, a hot bath and then to get back on her horse. If Gilman has further plans for her, I can accept where she left things at the end of Red Waters Rising. I don't love it, but I can understand it. If not? Then I've a word or two I'd like to have with the Devil about his newest employee.